I attended my college TEN year class reunion last weekend. Where has the time gone? It really seems like yesterday I was a carefree college student roaming the campus. Those four years were fun but flew by so fast! Too fast! 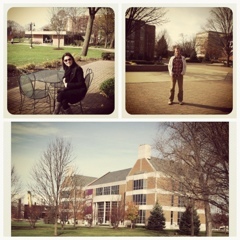 I enjoyed my college experience at Olivet Nazarene University. I received my degree - holla and met my Mr. Right! What more could I ask for? It was nice reconnecting with familiar faces and catching up with life long friends last weekend. I love making new memories! See me in the photo at the table below? This sits right outside the coffee shop on campus. Being the coffee lover that I am, I spent a lot of time here - but its extra special because it is also where my husband told me that he loved me for the first time. I love that boy and I love reminiscing about special times such as this!